What's the radius of a cylinder formula? How to find the radius of a cylinder? This radius of a cylinder calculator quickly finds the radius of a right circular cylinder with eight different equations. Do you need to solve a specific mathematical problem but you don't know how to find the radius of a cylinder? Try to enter a couple of parameters and see how simply this calculator works. This radius of a cylinder calculator is a handy tool that can compute the parameters of right circular cylinders. By the radius of a cylinder we mean the radius of two congruent circles that are bases of a cylinder. That's why this type of cylinders is called circular. You should remember that the word cylinder may correspond to different shapes (generalized cylinder). However, we usually have in mind the right circular cylinder. The cylinder is right when one of the bases lies precisely above the other. Otherwise, the cylinder is oblique. The calculator on this site was prepared to answer the question how to find the radius of a cylinder. In our other right circular cylinder calculator, you can find more general information about cylinders. Be sure to check it out! A radius of a cylinder is not always easy to estimate. However, with our radius of a cylinder calculator, you can now quickly compute it with the following eight radius of a cylinder formulas. They were all derived directly from the above equations. 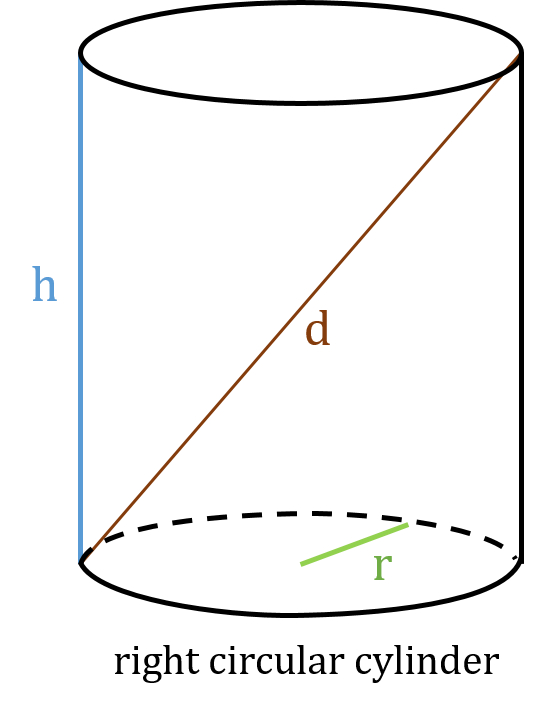 Given lateral area and total area: r = √((A - A_l) / (2 * π)). Do you need to calculate another parameter of a cylinder? You certainly need to check out our surface area of a cylinder calculator and cylinder height calculator too! Determine which parameters of a cylinder you know. Enter values of the selected quantities. Read out the result of the calculations. Isn't that simple? Moreover, with our calculator, you can choose units of every parameter you want. It can be very helpful in many calculations! If you want to learn more about unit conversions, be sure to check out the length and the volume conversion tools as well! 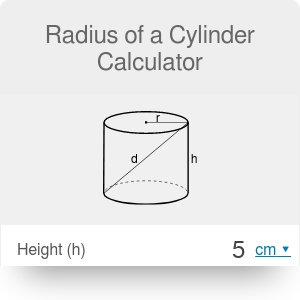 Radius of a Cylinder Calculator can be embedded on your website to enrich the content you wrote and make it easier for your visitors to understand your message.